> Dressgasm (verb) – the physical, emotional and mental reaction a person has when an astounding antique dress is displayed. See also: suitgasm, bootgasm, uniformgasm. I thought it would be interesting to institute a new feature on this new blog by showing an antique dress of the day. The specimens on display here must be the best of the best or they must be so unique in design that they beg to be shared. Most of them will be found on eBay and some will be found from museum exhibitions throughout the world. I literally have hundreds of images saved on my computer from the 18th and 19th centuries, so we will never be lacking in dressgasms. Today’s dressgasm is from a fresh listing on eBay. 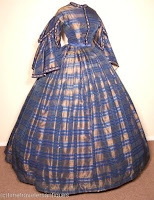 The dress is from circa 1863, right in the midst of the American Civil War. It is made of silk brocade in a gold and blue plaid pattern. Fabrics like silk brocade were rather expensive and could usually only be afforded by the upper class. The sleeves are sewn in the pagoda style. You can always identify pagoda sleeves by their distinctive bell shape and when a woman wore a dress like this, she always wore white cuffed undersleeves for warmth, modesty and protecting the dress from bodily oils and dirt. Pagoda sleeves saw their heyday in the 1850s, prior to the Civil War. Although they were still worn in the 1860s, sleeves with cuffs closed around the wrists were far more in fashion. An 1860s woman virtually always wore her dresses with a detachable white collar as well. The woman who owned this dress would have been no different. Collars were usually about two inches in width, plain white, or with simple lace. Wide, ornate collars were in fashion in the decades before the Civil War and largely went out of fashion by the Civil War, except with older women reluctant to let go of the fashions of their youth. The silhouette of a proper 1860s lady was designed to accentuate a tiny waist and hourglass figure by optical illusions. The shoulder seams were dropped below the natural shoulder line to give the illusion of width and the wide skirts were designed for both widening the hips and keeping men at a modest distance. Ladies clothing, especially in the upper class, was not meant to be functional. A woman was dressed in a visual metaphoric way to keep her delicate and dependent upon men for survival. Beautiful, yes, but fashion was one of the only ways a woman could express herself without being under the thumb of her husband, father or brothers.